In 2014, eMarketer released a report stating that the worldwide B2C (Business to Consumer) ecommerce market is expected to grow to $1.5 trillion in global annual sales. This is up nearly $500 billion from just two years ago in 2012, and is expected to rise nearly $800 billion to $2.357 trillion by 2017. Amazon alone had revenues of $74 billion in 2013 - up $50 billion from just four years ago in 2009. This represents a huge market that is growing at a rapid pace, with ecommerce increasingly looking to outgrow the physical retail world. Therefore, taking advantage of this huge boom should be considered paramount for every new and existing retailer. B2C ecommerce refers to the process of selling goods directly to consumers. This is what most people assume when they think of "ecommerce" (although B2B - Business to Business - ecommerce is a bigger market by sheer monetary volume). "Pure play" is a management term used to describe any business that specialises in one thing only. IKEA, for instance, is a "pure play" company that specialises in selling furniture. Ray-Ban is a pure play company that sells only eyewear and related accessories. This is in contrast to Tesco or Walmart, which sell everything from TVs to clothing to groceries and gifts. In the context of ecommerce, a pure play company is one that specialises in retailing only one type of product. A pure play ecommerce store can have a broad focus (for example, ASOS.com, which sells a variety of clothes for both men and women) or a very narrow focus (for example, Candy.com, which sells only different types of candy). 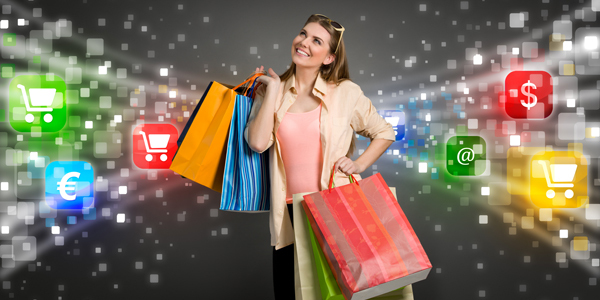 Pure play ecommerce is a great way for a new business to start selling online. The narrow focus means the business can place the emphasis on getting the fundamentals right, keep the inventory small, and corner an underserved niche. An ecommerce portal is the exact opposite of the pure play model. Instead of focusing on one product category, an ecommerce portal retails goods from multiple verticals. Amazon is the best example of a portal. It sells goods ranging from £1 party favours to £50,000 diamond jewellery. A portal is like any huge retailer such as Tesco, except that it is online. Running an ecommerce portal is extremely difficult and is usually not recommended for all but the most experienced and well-funded of businesses. The competition is immense and the broad nature of the portal model means you can't specialise in any particular vertical. This is an upcoming ecommerce category where the manufacturer sells goods directly to the consumer, bypassing the middleman entirely. Dell.com, the online store of computer manufacturer Dell, is a great example of this model. Dell sells its computers and peripherals directly to consumers through its website, cutting out the middleman and passing on the savings to the consumers. It's a win-win model for all - the manufacturer gets to deal directly with customers, and customers end up saving money. This is a viable model only if you manufacture goods yourself. A lot of small, home-based businesses have adopted the manufacture-direct model since it allows them to control distribution instead of chasing other retailers and middlemen. This is the ecommerce model pioneered by eBay. Instead of paying a flat fee for a product, you bid on it, just like at an auction (although eBay does offer the ability to add a buy-it-now option). Besides eBay, very few retailers have been successful with the auction model. Businesses looking to start selling online can consider listing their products on existing auction platforms like eBay to get started. This gives them exposure to a huge existing audience, and gives them the freedom to sort out pricing, customer service and shipping without worrying about payments and infrastructure. The world of business can be neatly divided into two categories: businesses that are built to be sold or go public, and businesses that are meant to be run continuously. In the former category fall all sorts of startups and companies with aggressive expansion plans. In the latter category fall all "lifestyle" businesses. A lifestyle business is one where the owner seeks to run the business for his/her own pleasure and sustenance. Most lifestyle businesses are run from home or small offices. The business owner strives to keep the business small and manageable, while maintaining agreeable profits and revenues. The whole purpose of a lifestyle business is to give joy to the business owner, rather than seek a huge exit or acquisition further down the line. Running a lifestyle ecommerce business is a great option for those looking to get started online. Thanks to drop-shippers (i.e. firms that take care of holding and distributing goods on your behalf), you can run a successful lifestyle ecommerce business while still maintaining an agreeable work/life balance. Sometimes called "clicks and bricks", this category includes all businesses that already had existing physical stores before launching their online retail shops. Both mom and pop stores and huge retailers with an online presence are included in this category (though they may also fall into any of the categories listed above). Stores in this category benefit from an existing customer base, a better understanding of customer service, logistics and inventory, and already have deep connections with distributors and other players within the industry. Of course, this business model is viable only if you already have an existing physical store. Whichever avenue you decide to pursue you'll find it necessary to enlist the services of various IT professionals including, but not limited to, web design and software developers, hosting providers and last, but by no means least, digital marketers to help get the word out. B2C is a vast market that is growing at a rapid pace. A new business can choose from any number of business categories, from a lifestyle business to an auction platform to get started.